Masonic meeting is not an act of worship. A lodge is not a church. And Freemasonry is not a religion. Freemasons use prayers to open and close their meetings, but so do Congress and Parliament. Freemasons take oaths (or obligations) on a Bible or other book sacred to the faith of the individual candidate, but so do Supreme Court justices, the President of the United States, police officers, courtroom witnesses, and even Boy Scouts. The misconception is that Masonic meetings are some sort of bizarre, secret worship service, offered up to a pagan god. Or goddess. Or goat. Or Satan himself. At any rate, no, they are not. So where did this ridiculous notion come from? Albert Pike: In his day, Pike was regarded as the greatest of Masonic scholars and authors. Many of his opinions about the origins of Freemasonry and its ceremonies have since been discounted as provably false, but at the time, Pike was the Mr. Know-It-All of the Craft. Pike got some of his material from works by an unreliable French mystic named Eliphas Levi. Levi claimed that Freemasonry came from ancient pagan mysteries, alchemy, Egyptian mysticism, Kabbalism, Gnosticism, Zoroastrianism, Brahmanism, and a raft of other –isms, and Albert Pike believed most of it. 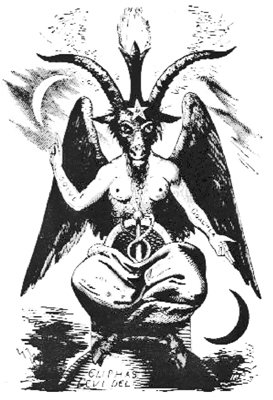 Baphomet: Eliphas Levi’s now classic drawing of the so-called Baphomet shows a creature with the bearded head and horns of a goat, female breasts, cloven hooves, wings and an upright pentagram on his forehead. The name Baphomet came from the trials of the Knights Templar during the early 1300s and was allegedly a demonic creature worshipped by them. Most people glance at this image and say, “Satan!” Face it — it looks like what we all figure Satan to look like. It didn’t help that Baphomet popped up as the most popular illustration for the Devil in tarot card decks, either. So what does this have to do with Freemasonry? In reality, absolutely nothing, but that never stopped a good urban legend. Leo Taxil: One of the greatest purveyors of Masonic lies of all times, duping the Western world for years with one increasingly ridiculous anti-Masonic book after another. In 1897, Taxil publicly admitted his lies, while making merciless fun of anyone who had believed them. He was especially gleeful that he had duped the Catholic Church, all the way up to the Pope, into issuing anti-Masonic statements.